Sgt. 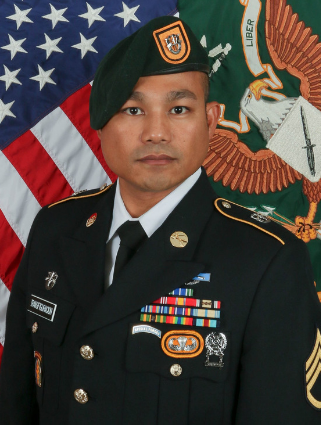 1st Class Reymund R. Transfiguracion, 36, of Waikoloa, Hawaii, died August 12, 2018 from wounds sustained as a result of an Improvised Explosive Device attack in Helmand Province, Afghanistan on August 7, 2018. Born in Sarrat Ilocos Norte, Philippines, on May 20, 1982, Transfiguracion enlisted as a motor transport operator in the Hawaii National Guard on July 25, 2001. He deployed with the Hawaii National Guard in support of Operation Iraqi Freedom from 2005-2006. He joined active duty on February 19, 2008 and deployed to Iraq in support of Operation Enduring Freedom from 2008-2009. Following his 2009 deployment, Transfiguracion was stationed at Schofield Barracks, Hawaii, where he deployed to the Philippines for six months in support of Joint Special Operations Task Force – Philippines from 2010-2011. Following his assignment in Hawaii, Transfiguracion attended Advanced Individual Training at Fort Leonard Wood, Missouri. His first assignment as a horizontal construction engineer was in Fort Polk, Louisiana. There he was selected for Special Forces. After completion of his Special Forces training at Fort Bragg, North Carolina, Transfiguracion was subsequently assigned to Joint Base Lewis – McChord and B Company, 3rd Battalion, 1st Special Forces Group (Airborne) as an engineer sergeant. In March 2018, he deployed to Afghanistan in support of Operation Freedom’s Sentinel.